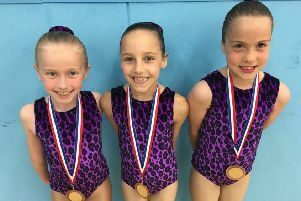 It was a delight for the Gosport club to compete in the exciting aerobic and rhythmic gymnastics British Championships and the NAC Cup 2018. This event showcased remarkable skills and Suki’s stars were in excellent form. Tyesha Kirton and Freya Meachen, both pictured left, combined to take a silver medal. Amiee Dalgleish, Immie Hamid and Keira Buick also picked up silver medals. The British Championships and NAC Cup took place at Telford International Centre over three days. 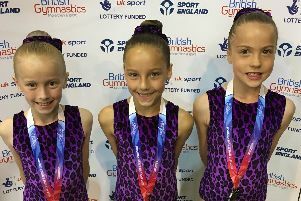 Over the weekend Suki gymnasts performed 13 routines.